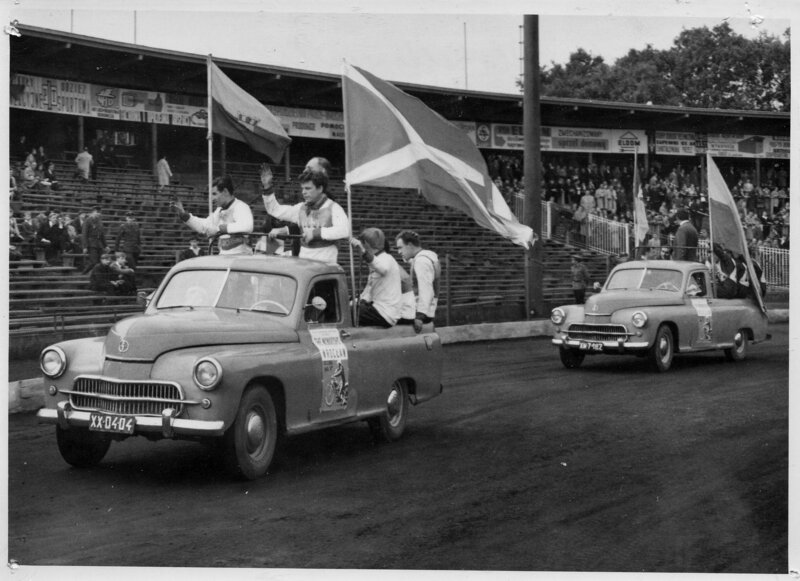 Monarchs don't have a great tradition of racing overseas, but they did have one tour to Poland in 1965. The tour party consisted of Monarchs' Templeton, Hunter, Persson, Harrfeldt and McKee plus guests Ray Wilson, Norman Storer, Geoff Pennikett and Jon Erskine. The team rode 6 matches in 10 days, and while they lost them all, they gave a reasonable account of themselves other than in the final match. This picture is from the opening match of the tour on 10th October 1965, at Sparta Wroclaw (the venue five years later for the World Final). We haven't drawn a capacity crowd but hopefully there are many more fans to the right of the photo in which you can see George Hunter, Bernie Persson, Colin McKee and Henry Harrfeldt greeting the crowd, with the Monarchs' flag flying on the truck. The picture and a number of others from the tour was loaned to us by Dave Morris.